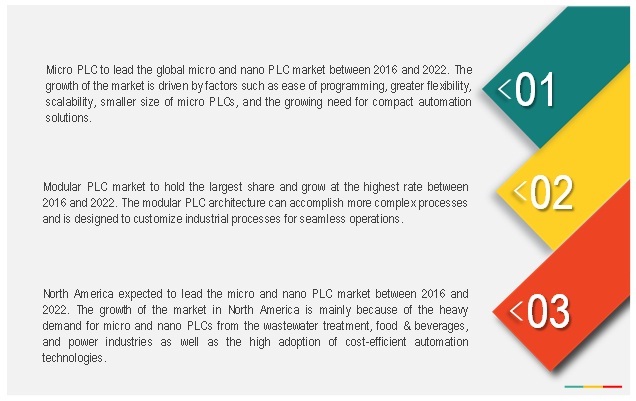 [159 Pages Report] The micro and nano PLC market was valued at USD 5.58 billion in 2015 and is expected to at a CAGR of 6.9% between 2016 and 2022. Programmable logic controller (PLC) is a digital computer used for the automation of industrial electromechanical processes. The PLC continuously monitors the state of input devices and makes decisions based on a customized program to control the state of output devices. On the basis of input/output (I/O) points, two types of PLCs have been defined in the report, namely, micro PLC and nano PLC. Micro PLC has 36 to 256 I/O points, whereas nano PLC has less than 36 I/O points. The increasing automation of industrial processes, demand for compact automation solutions, and widespread adoption of IoT connectivity are the key influencing factors of the market. The base year considered for study is 2015 and the forecast period is between 2016 and 2022. An increasing number of smart factories across the globe are demanding compact, scalable, and flexible automation solutions. These compact automation solutions help companies to control their inventory and reduce transportation cost. In addition, most customers prefer smaller devices that have the same functionality as larger devices for many industrial automation processes. Micro and nano PLCs are smaller in size, faster in speed, and have almost the same capacity as larger PLCs. They provide additional functions in smaller packages and can be used effectively for control applications where the space is limited. The micro and nano PLCs can handle complex sequencing functions and switching of small control devices. Thus, micro and nano PLCs are used for compact automation solutions in various industries such as food & beverages, pharmaceuticals, chemicals, oil & gas, and water & wastewater. To strategically profile key players and comprehensively analyze their market ranking and core competencies, along with detailing the competitive landscape for market leaders. The micro and nano PLC ecosystem comprises component providers, OEMs, system integrators, software providers, and distributors. The players involved in the development of micro and nano PLC include Siemens AG (Germany), Schneider Electric SE (France), Rockwell Automation Incorporation (U.S.), Mitsubishi Electric Corporation, and Omron Corp. (Japan), among others as well as associations such as Institute of Electrical and Electronics Engineers (IEEE) and International Society of Automation (ISA). In May 2016, Rockwell Automation Inc. launched CompactLogix 5380 in the Logix series. The Allen-Bradley CompactLogix 5380 controller improves I/O response time as fast as 0.2 milliseconds which help to increase the production in the manufacturing industry. In May 2016, IDEC Corp. launched Microsmart FC6A, a micro PLC with up to 520 I/O. It has fast processing speed, high-capacity programing and data memory, and the ability to handle up to 126 analog I/O. this product is well suited for oil & gas, chemicals, solar, packaging, and food and beverages industries. In February 2015, Siemens AG expanded its portfolio of advanced controllers in the SIMATIC S7-1500 family with the addition of two particularly compact controllers, namely, SIMATICS7-1511C and S7-1512C. These two controllers combine CPU with inputs and outputs in one enclosure. This research report categorizes the global micro and nano PLC market on the basis of type, offering, architecture, industry, and geography. What are new application areas which the micro and nano PLC manufacturers are exploring? The micro and nano PLC market is expected to reach USD 8.89 billion by 2022, at a CAGR of 6.9% between 2016 and 2022. The growth of this market is propelled by the growing industrial automation, requirement for compact automation solutions, and growing home and building automation market. Micro PLC is expected to hold a large share of the overall micro and nano PLC market in 2016. Micro PLC offers various key benefits such as ease of programming, scalability, and smaller size. Furthermore, micro PLCs have a high demand owing to the growing need for compact automation solutions. 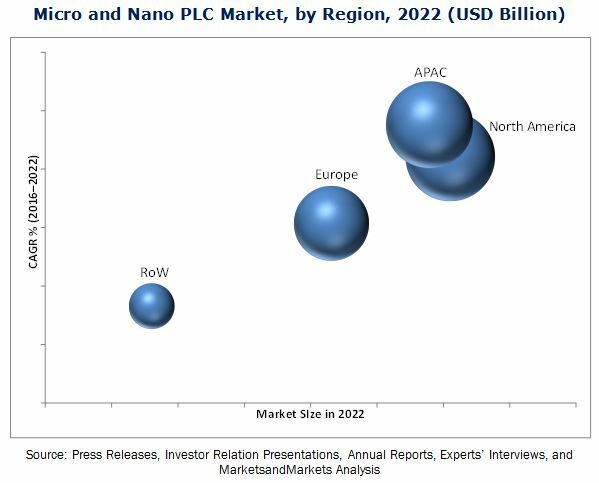 The nano PLC market is expected to grow at the highest CAGR between 2016 and 2022 owing to its lower cost, greater flexibility, and compact size. The market for the hardware segment accounted for the largest share of the micro and nano PLC market in 2015. The technological advancement in hardware components and the increasing number of new product launches and developments would increase the adoption of hardware across industries such as automotive, food & beverages, oil & gas, chemicals, and pharmaceuticals, among others. The market for software and services is expected to grow at the highest CAGR between 2016 and 2022. The increasing level of automation at industrial plants has created the need for software to save time in the design of automated control applications and increase the level of safety while handling the equipment. The modular PLC architecture is expected to hold the largest market size and grow at the highest rate during the forecast period. Modular PLCs are widely used in complex processes. They are easier to troubleshoot and allow some processes to be operational while the issues are being fixed. Furthermore, modular PLCs are designed to customize industrial processes for seamless operations. The fixed PLC market is the second-largest in the global market. Fixed PLC is inexpensive compared to modular PLC and is an ideal solution for compact machineries with limited space and functionality. The automotive industry dominated the micro and nano PLC market in 2016. The highly competitive automotive sector is one of the early adopters of micro and nano PLCs. The use of micro and nano PLCs helps the industry to save time during assembling, resulting in increased productivity. The market for the food & beverages industry is expected to grow at the highest CAGR between 2016 and 2022. The players in the food & beverages industry are majorly focusing on offering technologically advanced and high-quality products while keeping the production costs low. Thus, there is a growing demand for micro and nano PLCs in the food & beverages industry. North America accounted for the largest share of the micro and nano PLC market during forecast period. The automation and servicing requirements are shaping the demand for micro and nano PLCs among process industries in this region. Further, supportive government programs, events, and conferences are also driving the growth of the North American market. APAC is expected to be the fastest-growing market in the overall market during the forecast period. The major driving factors for the growth of the APAC market are increased number of manufacturing facilities, aging infrastructure, and trend of smart manufacturing. The micro and nano PLCs are used in automotive industry to mainly create uniform products which results in lower production cost. Micro PLCs and nano PLCs provide an ideal solution to replace relays and automate small processes of automotive manufacturing. In the automotive industry, the micro and nano PLCs control field devices such as sensors, transmitters, and actuators by directly communicating with them. The production line of automobile industry consists of various processes such as assembly, painting, welding, and stamping. Each process requires micro and nano PLCs for controlling their operations. Home & building automation is an emerging concept in the market. The micro and nano PLC has huge scope to grow in the home & building automation market. PLCs are majorly used in the lightning control system, parking lot monitoring, HVAC system, and alarm & safety systems. PLC is connected to lighting system via relays. PLC is used for controlling lighting which would minimize the switch wall clutter by replacing it with a low voltage switching solution such as keypad. Further, PLC controls the building’s water system, which determine the water level in the tank and turns off the water feed of the building in case of emergency. One of the most common home automation applications is security system. PLC not only monitors the house but also keeps a check of gas leak, fire, glass break-in, and door break-in when the owner is away from the house. Where will all the market developments take the industry in the mid to long term? What are the upcoming industry applications for micro and nano PLCs? One of the key restraining factors for the micro and nano PLC market is the additional cost incurred while expanding the I/O capability of micro and nano PLC. The I/O points of micro and nano PLCs are lesser than that of large and medium-sized PLCs. In certain applications, there is a need to expand the number of I/O modules of PLC to accomplish the complex processes which leads to additional cost. 11.2.1.1 New Product Launches and Developments Expected to Drive the Market in the U.S.